Sameer Shukla studied B Sc from Lucknow University. After graduation, he did his LLB from Lucknow University. He joined Custom and Central Excise in 1985 at Bareilly (Indo- Nepal Border). He took a premature retirement in 1996 from IGI, Airport. He started working on creation of museum in 1997 and founded Soham Art Centre in Mussorie. A curator (from Latin: curare, meaning "to take care") is a manager or overseer. Traditionally, a curator or keeper of a cultural heritage institution (e g, gallery, museum, library, or archive) is a content specialist charged with an institution's collections and involved with the interpretation of heritage material. "After finishing my BSc and LLB from Lucknow University. I started my career in 1985 as a preevntive officer from Barielly (Indo- Nepal Border). I took my premature retirement in 1996 from IGI, Airport. 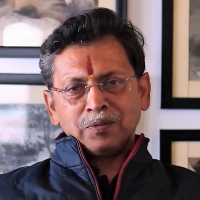 I started with creation of museum in 1997 and founded SOHAM Art Centre in Mussoorie." Preventive Officer (P O) is the only customs post with uniform offered through SSC CGL.It collects indirect taxes and duties like Central Excise duty, Customs duty and Service tax. "After finishing my BSc and LLB from Lucknow University. I started my career in 1985 as a preevntive officer from Barielly ( Indo- nepal Border). I took my premature retirement in 1996 from IGI, Airport."